The unique harmony of Green Gables’ architecture and gardens pays tribute to elements of three iconic lands: Italy, England, and California. Italian formal tradition is found in the symmetrical layout of Green Gables’ gardens, yet the property's broad green lawns were inspired by the famed Fountains Abbey of Studley Royal Park in early 18th-century England. 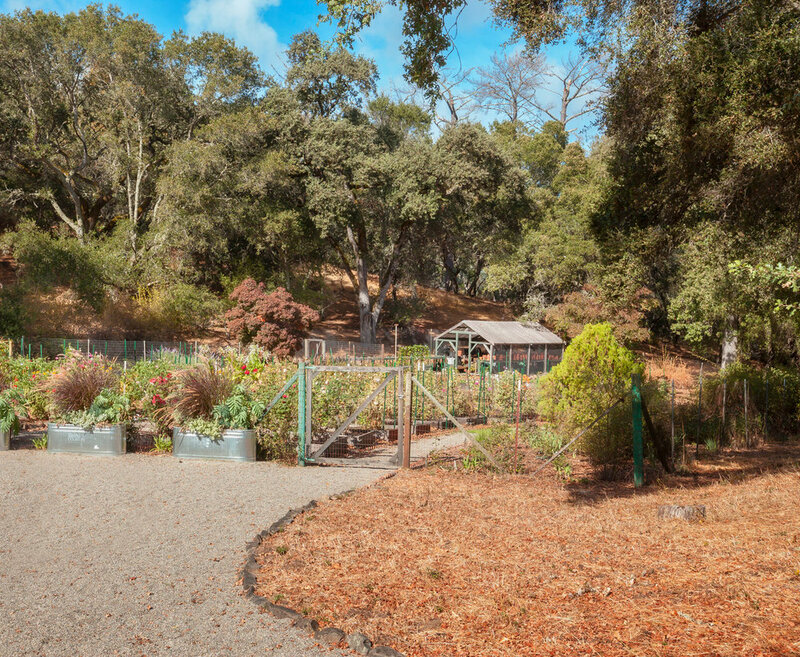 Green Gables' natural landscape boasts an abundance of classic California plants, grasses, and native old-growth trees, including stately live oaks, giant sequoias, Monterey pines, fragrant eucalyptus, and blue spruce. English laurels, cedars, and a stunning lane of twisted, drooping Camperdown Elms were meticulously placed by the architects to frame the majestic views of the Santa Cruz Mountains.. The integrated edible vegetable and cutting flower garden with its beautiful roses and dahlias combined with delicious berries and abundant produce contribute to the wonderful storybook lifestyle of the estate. The Roman Pool, flanked by freestanding stone arches, is reminiscent of the pool at Hadrian’s Villa, a UNESCO World Heritage monument found in Italy. Nature flourishes on the property year round; the geography and climate of Green Gables are enviable on a world-class scale. The Mediterranean climate means mild weather all year, from snow-less winters, with temperatures ranging 60°F (16°C) to 36°F (2°C), to dry summers with temperatures ranging 88°F (31°C) to 51°F (11°C). Geographically, Green Gables sits between San Francisco Bay to the east, and the Pacific Ocean to the west. The Santa Cruz Mountains separate it from the ocean, creating a natural barrier to Bay Area fog. The sustainability of the property is assured through a 50,000 square foot reservoir, sourced by an underground spring and winter runoff. Measuring 20 feet at its depth, it irrigates 90% of the land.